To hear a specific section of the sound element, adjust the playback range in the Sound Element editor to start or stop at specific frames. This customized playback range does not affect the actual sound in the Sound element. Drag the start or end range markers in the Sound Element section to the boundary frames you want. 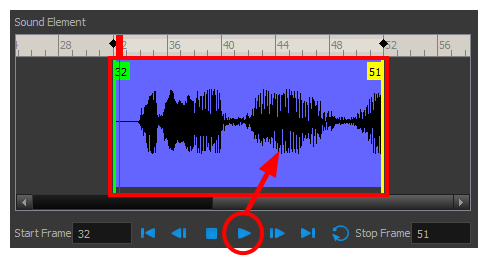 When you click the Play button to play back your sound in the Sound Element editor, it only plays the sound which exists between the two markers.